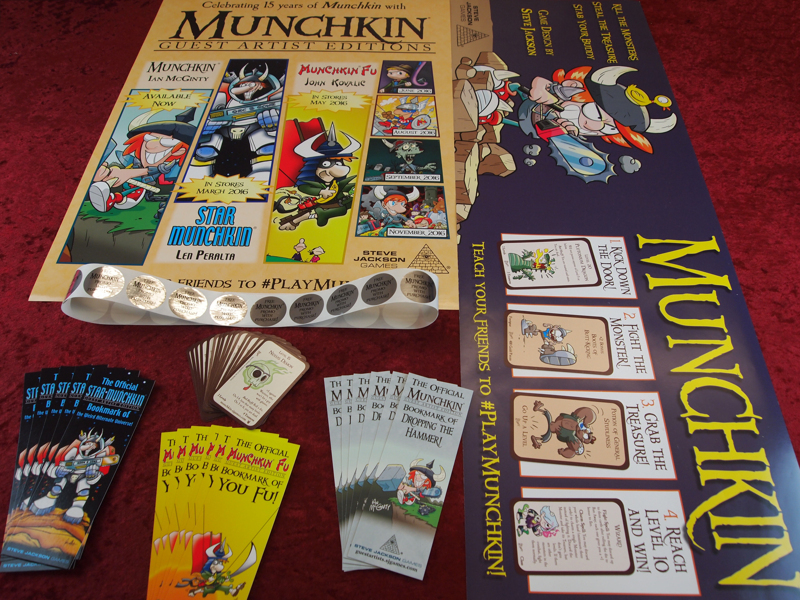 Daily Illuminator: Request Your Munchkin Guest Artist Edition Retail Promo Kits Today! January 28, 2016: Request Your Munchkin Guest Artist Edition Retail Promo Kits Today! Munchkin fans, how would you like to get the newest Munchkin bookmarks -- complete with in-game benefits -- and the latest promo card? You can . . . if your favorite local game store contacts us right now! Celebrating the launch of our first Guest Artist Edition, illustrated by Ian McGinty, we have assembled a limited number of special promo kits for game stores. These kits are packed with a brand new Munchkin promo card, three new bookmarks, and a handful of other items the store can use to add a little Munchkin flavor to the place. We are reaching out to the stores that are already in our Store Finder, but if you want to guarantee that your favorite game merchant gets in line to receive one of these free kits, please help us spread the word and tell your retailer to contact Joshua. While you're talking to them, you may want to preorder Ian McGinty's Munchkin Guest Artist Edition, if you haven't already. This game will start to appear in stores next week, and once they sell those copies, that's it; we have no more in our primary warehouse and we have no plans to reprint the game. Thanks, everyone, for 15 great years of Munchkin! This is an amazing start to a fantastic year of new Munchkin goodies.